Which Statistical Software to Use? Quantitative Analysis Guide: Which Statistical Software to Use? The first version of SPSS was developed by Norman H. Nie, Dale H. Bent and C. Hadlai Hull in and released in 1968 as the Statistical Package for Social Sciences. In July 2009, IBM acquired SPSS. Great set of online resources! Stata was first released in January 1985 as a regression and data management package with 44 commands, written by Bill Gould and Sean Becketti. The name Stata is a syllabic abbreviation of the words statistics and data. The graphical user interface (menus and dialog boxes) was released in 2003. The specific Stata package (Stata/IC, Stata/SE, and Stata/MP) limits the size of usable datasets. One may have to sacrifice the number of variables for the number of observations, or vice versa, depending on the package. Overall, graphs have limited flexibility. Stata schemes, however, provide some flexibility in changing the style of the graphs. The development of SAS (Statistical Analysis System) began in 1966 by Anthony Bar of North Carolina State University and later joined by James Goodnight. The National Institute of Health funded this project with a goal of analyzing agricultural data to improve crop yields. R first appeared in 1993 and was created by Ross Ihaka and Robert Gentleman at the University of Auckland, New Zealand. 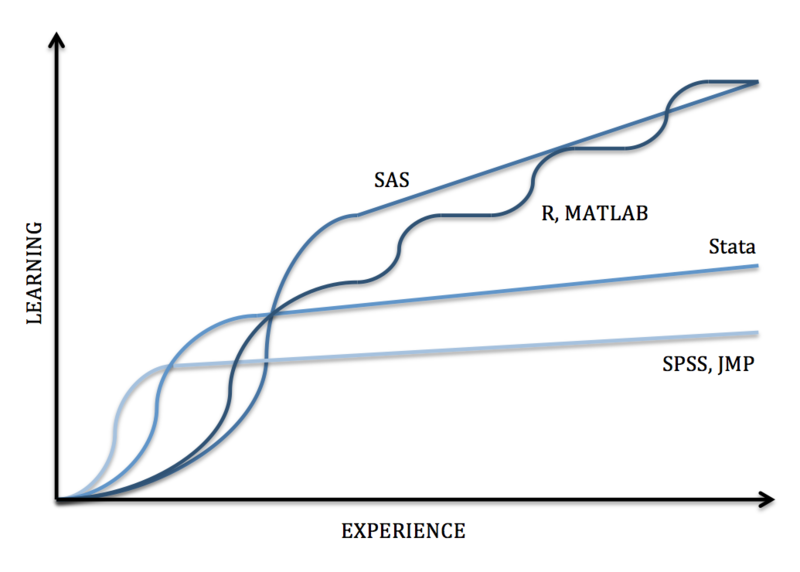 R is an implementation of the S programming language which was developed at Bell Labs. It is named partly after its first authors and partly as a play on the name of S.
R is currently developed by the R Development Core Team. RStudio, an integrated development environment (IDE) was first released in 2011. Scope of functions, flexible, versatile etc..
Cleave Moler of the University of New Mexico began development in the late 1970s. With the help of Jack Little, they cofounded MathWorks and released MATLAB (matrix laboratory) in 1984. *The primary interface is bolded in the case of multiple interface types available.